A friend brought me this saber and asked me to identify it. It is 36" long (91 centimeters) and weighs just over 2 lbs (about 900 grams). It's rusty and feels blade heavy though manageable. The pommel / disk (I forgot what it's called on a Talwar) is slightly canted and is currently loose. The blade is sharp and has a sharpened partial false edge. The spine of the blade is quite thick, much thicker than my Sikh ritual Talwar. There are no fullers. It has numbers cut into the quillon which you can see in the photo. Looks like B 817 with maybe some other character above the B. The opposite quillon has some kind of notch cut in it or maybe it's another symbol. 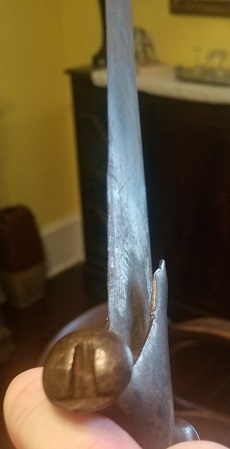 The blade has some notches in it as if someone was fencing and it has clearly been sharpened many times as it's slightly worn away from the edges. It came with a broken piece of a scabbard made of light wood covered in what looks to me like brown leather but I assume would be something else if it's from India. 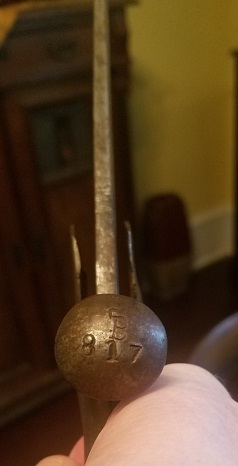 My guess was early 20th C maybe 19th C Indian Talwar, maybe military issue, but other than that I have little to go on. Was hoping somebody else here might be able to help. One of the things I'm wondering is if it's Ok to clean the rust off and put some oil on it. Mole made tulwar for the India forces and there were generalized patterns produced right around the 1900 mark but iirc also some may date to the Sepoy mutiny period. At any rate, a sword from British military stores. The late 19th century examples in canvas scabbards and some marked to Mole. My hunch it is of the later period. There are plenty of sword conservation tutorials out there. Evapo Rust is something I mean to try but there are plenty of options. This is basically what I was thinking, although the idea of this possibly being involved in the Sepoy rebellion is pretty cool! Any idea of the approximate value of such a saber so I can tell my friend? $200 or so would be my guess but what do you think? I think the rust looks worse than it is, and sandpaper and oil should do it, but the blade itself is certainly a bit worn and notched. I don't follow prices on these much but I can recall a Mole marked example with its scabbard at around $300 usd and run of the mill examples more or less in the ballpark you are suggesting. I am far from schooled on these, so don't take my thoughts as any gospel. There are many more familiar with the subject but these "munition" types do seem to run in the second half of the 19th century and seem to be more abundant towards 1900. So that is a 'mole mark' on the opposite quillon post? As in mole of Birmingham? Evapo Rust is something I mean to try but there are plenty of options.